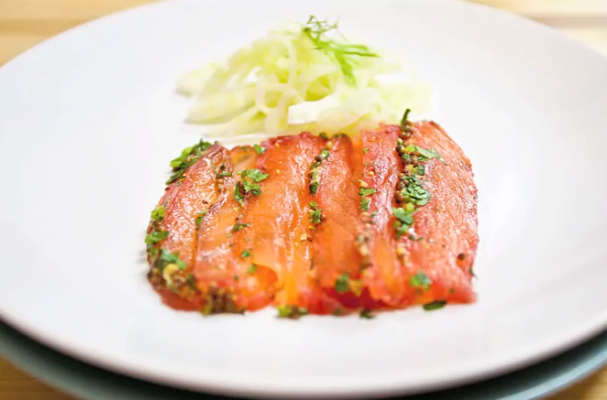 Salmon gravlax is a simple, yet elegant dish. This traditional Scandinavian dish is made by curing a large salmon filet in a mixture of equal parts salt and sugar. This recipe takes it one step further and adds shaved beet and orange zest to another layer of flavor to the salmon. Since this the salmon needs quite a bit of time to "cook," it is best to prepare this meal a day in advance. It is important to use the highest quality salmon you can find because the meat is served in a raw form, meaning not cooked using heat. Gravlax is a beautiful starter course that is delicious with slices of sourdough bread and fresh fennel.